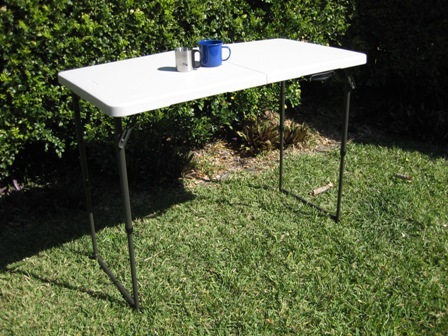 Our Lifetime 4’ bi-fold, height-adjustable table is a handy piece of camping kit. It can be used as a standing height bench, standard height table, a low table for the kids or as a side table while sitting down. Sturdy camping tables that allow food preparation and washing up at a suitable height for standing up are hard to come by. Most of the benches marketed as camp kitchens are only 80 cm high – too low for most people. The Lifetime table is perfect at the standard kitchen bench height of 90 cm, but can also be adjusted lower to 72.5 cm and 55 cm. The table top area is 120 cm x 60 cm. One of the challenges when camping is to find gear that can be used for several purposes. Why take a bucket for washing up, and then store your dishes and cutlery in a separate container? Why not use the washing up bucket to also transport the dishes and cutlery to save space and weight? Or why take a bench and a table, when one piece of gear will do both jobs? The Lifetime 4’ bi-fold, height-adjustable table will do several jobs and folds up to a very compact size for transportation – 60 cm x 60 cm x 7.5 cm. The only problem I have found with this table is that it has quite a slippery surface. If the table is on even a slight slope, cups and dishes slide off it. A couple of non-slip mats will quickly fix this. If you are looking for a rock solid table, this one is not for you either. However, some movement in the legs is acceptable for camping purposes, particularly given the uneven ground it will often be used on anyway. Selected Lifetime tables are distributed in Australia by Oztrail. I bought mine from Down Under Camping. 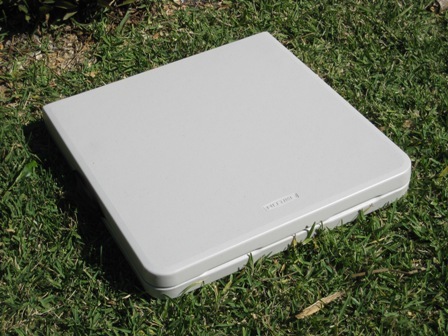 This entry was posted in Gear and tagged Camping, Review on 26 August 2010 by Rex.